ON THE COVER: Bella Leggett ‘22 gives her friend from Promise Academy a push while playing at the Outdoor Discovery Center. We build character through service to others. Lausanne believes that every student can make a difference. Showing empathy for others begins by helping students understand the importance of community involvement and service to others. Through the International Baccalaureate Programme at Lausanne, students are encouraged to step outside of their comfort zone and to share their uniqueness and strengths with others to build a better future. Our goal is to move beyond awareness and into action, starting with our community and progressing toward the rest of the world. For Valentine’s Day, our Junior Kindergarten classes made Valentine’s Day cards for the residents of Kirby Pines Retirement Community. As Elliott Schulter ’32 passed out the handmade cards to her great grandmother’s friends, she made sure to let them know which classmate had worked on each Valentine. The recipients beamed with delight at the gifts. Because of its place at the core of so many other lessons at our school, teaching students how to be caring and serve their community is fundamental to Lausanne. Experiences like making Valentine’s Day cards for seniors help develop a student’s empathy and their ability to see and understand other perspectives and feelings. They begin to shift from focusing on the self to focusing on the larger community, gaining an understanding of the impact their individual actions have on the greater world. As they grow, that knowledge allows them to approach problems in a variety of ways and helps them develop solutions that benefit everyone. As students move into the IB Middle Years Programme, they expand their knowledge of global contexts. Personal and Community Projects challenge students to identify issues and work to find solutions they can employ. As they do, they are given an opportunity to see if their ideas are effective and to learn new ways to help serve others. Later in this magazine you’ll read about the Food Equity Project, an effort by our Middle School students to learn about food insecurity in Memphis. The students are now working to create their own non-profits geared towards addressing the issue. With each successive step, our students gain more confidence and take responsibility for their own service outreach. As they advance into the IB Diploma Programme during their final two years at Lausanne, students complete Creativity, Action and Service (CAS) requirements, broadening their approaches to complex problems and serving the community as they work through solving them. After learning that many patrons of the Church Health Center had health issues that could be cured through exercise, Matthew Russell ’19 used his CAS hours to collect, repair and donate used bicycles to the non-profit. Through the process of serving others, Lausanne graduates become empathetic, caring individuals that are prepared to change the world. As the stories in this magazine prove: they’re already making an impact for the better. As Lausanne Lower School students dispersed from the dining hall at the end of their lunch period, five fourth-graders caught my attention as they lingered behind. When the room cleared, the students began picking up and wiping the lunch tables clean. Out of curiosity, I walked over and asked the story behind their cafeteria cleanup. “We take turns helping clean so the lunch room will stay nice for everyone,” a student said as she moved from one table to the next. “We get to help with different jobs each week like passing out papers for our teachers and returning iPads around campus to the right place. We also help clean our classroom whiteboards, and we hold doors open for people too.” Witnessing their efforts to help out around campus is a reminder of the compassionate characteristics instilled in the students of Lausanne. Even with the simplest tasks, by helping others the fourth-graders gain awareness about making a positive impact within the school community while caring for the people around them. 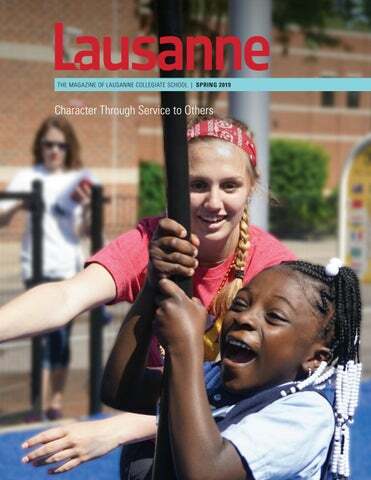 Building character through service to others is encouraged across all grade levels at Lausanne, from the time a student enters Pre-Kindergarten to the moment they cross the stage at graduation. Whether through an act of kindness that brightens a person’s day or service projects that benefit a community, serving others is a key component in making the Lausanne experience impactful for our Lynx. I hope as you read the stories in this magazine, you will be inspired by the empathy our students have shown others and their determination to make a difference in the community through service work. A RECIPE FOR SERVICE Brooklynn Rossler ’30 tapped her finger on her chin as she carefully considered which color to use next. With her decision made, the firstgrader picked up the purple marker and drew on the card in front of her. “I am drawing a heart because I want them to know my heart cares for them,” Brooklynn explained. The students in Mrs. Whittaker’s class were spending the morning making hand-made cards for their senior friends from the Metropolitan Inter-Faith Association (MIFA) program. The local non-profit is organization that offers different programs to support the independence of vulnerable seniors and families in crisis through humanitarian work. For the first grade service project, students focused on the Meals on Wheels program that MIFA does, which provides hot, nutritious lunches for homebound elderly and seniors at congregate meals sites in the Mid-South. Their sweet efforts were a part of the year-long service project all of the first grade completes that ties into the six Primary Years Programme (PYP) Units first-graders learn throughout the school year. While learning the PYP unit How We Organize Ourselves, the class of 2030 has been creating recipes and products using herbs and spices they grew themselves and designing a menu for the student-led food truck marketplace they plan to host. Customers can purchase a food ticket to experience food the first-graders have prepared and to shop their collection of mint sugar scrubs, herb planters and lavender soaps. During this unit, first-graders learn about marketing, money management, customer service, recipes, measuring ingredients and food preparation. Over the years, Lausanne first-graders have contributed more than $8,000 to support MIFA’s mission to help vulnerable seniors. Through their gifts to Meals on Wheels, MIFA has sustained the health and well-being of countless homebound men and women. Lausanne has had a special relationship with MIFA since connecting with the organization in 2012 when the first service project in first grade was organized with the unit of inquiry. “I love that MIFA allows us to come in and do hands-on activities in their facility,” said first grade teacher Christina Mewborn. “I think this is the most integral part of the project. This is where students get to see first-hand that their restaurant profits go toward something tangible and real.” The first-graders have been pouring their hearts into their service work all year, and their acts of kindness throughout the process provide just a glimpse of the compassionate characteristics Lausanne students build during their time here. But upon entering the room, it was hard to distinguish what stuck out more: the significant amount of food that had been donated or the striking sign on the wall that read â&#x20AC;&#x153;Hunger is closer than you think.â&#x20AC;? Lausanne seventh-graders and Nashville area alumni filed into a large warehouse connected to the Second Harvest Food Bank in Nashville, where hundreds of boxes were waiting to be sorted into green plastic containers labeled by different foods. Volunteering at the food bank was eye-opening for the students and was just the beginning in igniting a spark to provide service to others and find solutions for issues their own community may be facing. For their year-long service project that is a part of the IB Middle Years Programme, the seventh grade students and teachers decided to help fight the food equity problem in Memphis. The goal of the service project is for the students to use the knowledge and skills they develop in their classes to create a workable plan to help identify the problem and find solutions. With help from their teachers, the students use a cross-curricular approach by working on separate aspects of the project in each of their core classes Math, Science, Social Studies and English. To start the project, the class of 2024 spent a day in Ms. Simpson’s English class reading stories and listening to interviews of families from diverse locations and backgrounds who were either food insecure or living in a food desert. After watching the videos, the students reflected privately before discussing with the class what they thought about the situations they had observed. “For the most part, the students were unfamiliar with the concept of food equity, but after watching the video clips, they were deeply bothered by the idea that families were not able to feed their children or provide them with proper nutrition because of circumstances outside of each family’s control,” said seventh grade English teacher Hilary Simpson. With their new realization of the problem some families face came more questions relating to food equity like food deserts, food insecurity, the relationship between food and health and the relationship between food and education. Because of these inquiries, the seventh-graders developed questions to investigate in Ms. Cooper’s Social Studies class. Here, students learned better research skills while researching information on the questions they formed during the English portion. After talking through different ideas, the LCS Innovations business made scented candles, all-natural air fresheners, bath bombs, soap, lip balm and lip gloss. Throughout the school year, the students hosted pop-up shops where they sold the products to help raise money to donate. Once the seventh-graders have sold all their products, their next step will be to research local organizations that relate to the food equity problem and decide what organization will receive the proceeds. A lot of time and effort was put into creating their products, and their natural supplies came straight from the community garden they’ve been tending to in Mr. Brezina’s Science class. To tackle the shortage of food, students have been growing herbs and produce like kale and lettuce in the community garden. In their English class, they’ll decide on an organization to donate the food. “Our seventh-graders have been very responsible when it comes to tending to the community garden,” said seventh grade Science teacher Tom Brezina. “They understand the depth of the issue and their compassion towards this project has been evident through their hard work and dedication during the process.” While the seventh-graders busily and passionately worked on different pieces of the project, the teachers reached out to people and organizations around Memphis who have dealt with food equity in some capacity so students could hear from these individuals. The teachers invited representatives from Big Green Memphis, The Mid-South Food Bank, Crump Elementary and Girls Inc. to be a part of the Lausanne Middle School Food Equity Summit, which the students hosted in EPAC to speak about how their organization works with the community to bring solutions. It has been a very busy year for the seventhgraders, but also an incredible experience that has offered real-world applications through entrepreneurship, social justice, investigation and communication. From investigating a concern to developing a plan to address the issue, the class of 2024 has been a part of an eye-opening experience, showing them how to address problems in the future. With their newfound perspectives, our students will work to be a part of the change, show compassion towards others and to be a force for good in their community, because that’s The Lausanne Way. Five seventh-graders volunteered to moderate the panel and were given the opportunity to ask the representatives questions they developed themselves. Students walked away from the summit with a clearer understanding of communities in Memphis without access to a grocery store, gardens that donate their food to underserved schools and how children in the area do not have the same resources as many Lausanne students. On a crisp Thursday afternoon, Lausanne freshmen piled onto the school bus to head toward Crump Elementary School. At the beginning of the school year, Lausanne freshmen partnered with Crump Elementary to help tutor their younger peers in different subjects. The Class of 2022 is the pilot class for the partnership and is a part of the Freshman Class Project. The program develops into a four-year experience for the students. The bus ride was a quick 10-minute drive into North Memphis, but for the students, it seemed like an eternity. The driver turned into the parking lot and came to a halt, and the members of the Class of 2022 excitedly exited the bus, led by Upper School Counselor Samantha Douglas. Through this experience, the freshmen have found that these students are just like the kids they know and see every day. “The kids at Crump are a lot like my younger brother,” shared Jonah Smith ’22. “It’s cool to see the similarities that we have. Someone else’s circumstances might be different, but they are entitled to the same education and opportunities.” During some visits, other events were taking place at Crump. On those days, Lausanne students would join in the activity instead of tutoring the students. The freshmen had to adapt quickly to the change of plans and engage with the Crump community, and often, these days turned into incredible experiences for both sets of students. “It has been really cool to watch relationships grow between Lausanne and Crump students, overhear conversations after their visits and even watch our teachers experience this program,” said Mrs. Douglas. “It’s always exciting to see that passion for service arising in people.” After a successful first year with Crump Elementary, efforts continue to grow this partnership into a long-lasting relationship. Lausanne consistently strives for its students to build character through service to others, and the Crump Elementary relationship is a step in the right direction. This experience has taught our freshmen new skill sets in tutoring, leading those who are younger and has provided them with a sense of empathy for children’s education. 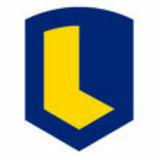 Along with Lausanne, schools across the nation developed their own campaigns to benefit St. Jude. While the Lynx raised $18,032, the highest total in the country, the total amount raised through Pledge It for St. Jude was $125,726. The seniors on the Lausanne football team were invited to spend a morning with representatives from MaxPreps, CBS Sports and Pledge It, touring St. Jude’s Target Houses and attending a check and trophy presentation ceremony. The Lausanne cheer team returned home from their second trip to Nationals as a team on the rise in the Memphis cheer scene after finishing ninth in the nation. The Universal Cheerleading Association (UCA) National High School cheerleading competition is the most prestigious national cheerleading event in the country. Held in Orlando, teams have to first qualify at a UCA regional competition to earn a bid to nationals. The Lynx punched their ticket to Nationals by finishing second in their regional competition at the Landers Center in Southaven in October. Both the girls and boys seventh and eighth grade basketball teams won the Shelby County Seventh and Eighth Grade Championship. Lausanne was led into the girls’ game by captains Kolby Cohen ‘23 and Lucy Fisher ‘23, who held the team together all season. It was their fourth time to face the Grace St. Luke’s Saints, and while they had managed to win in previous matchups, the Lynx knew it would be a tough game. MacKenly Randolph ‘24 scored 20 points and had 15 rebounds, earning the title of MVP of the tournament. Tyler Jones ‘25 scored 7 points, while Jinnda Kane ‘24 added 6 more to the effort. At the final buzzer, the Lady Lynx were victorious, winning 38-33. The Lausanne boys faced an impressive GSL team for the third time, with the Saints winning the last two games between the rivals. Kylon Jones ‘24 led the charge with 29 points, followed by 16 points, 11 rebounds and four assists from Trey Davis ‘24. Drew Scott ‘23 also earned the Lynx 10 points and 10 rebounds. With a final score of 64-55, Lausanne took the win and with it, the championship. SEVENTH-GRADERS HONORED IN DUKE TIP RECOGNITION: Each spring, Duke TIP holds special award ceremonies to honor Seventh Grade Talent Search participants who do exceptionally well on the ACT or SAT. The ceremonies are similar to graduation ceremonies and are hosted on college and university campuses. The event includes a keynote address and honorees walking across the stage to receive a commemorative medal. Lausanne students that were awarded state recognition include Whit Faughnan, Dexter Gard, Dany Hamze, Zoeya Khan, Matthew Kulubya, Malaika Kumar, Risha Manga, Isaac Sheehan, Nikhita Srinivas, William St. Clair and Jasmine Younes. LAUSANNE SPELLING BEE CHAMP Will Carter ’24 won this year’s Lausanne spelling bee by spelling the winning word “demonstrable” correctly. JUNIORS AND SENIORS TAKE THEIR CAS PROJECT TO BELIZE Twelve Lausanne juniors and seniors took their graduation requirement to complete a CAS (creativity, activity and service) Project across international borders to Belize. Students partnered with Santa Elena Primary Catholic School in San Ignacio, Belize. Students ran winter break camps involving science experiments, theatre design camps, math enrichment programs and sports introduction camps. Students also worked with Belize Wildlife & Referral Clinic on graphic design and a new media campaign for their program to inform others of the work and programs offered by the clinic. As a component of the IB programme, the CAS Project requires students to initiate and complete a project of their own design, coordination and planning over at least 30 days. For the Belize trip, students began work in September on coordinating ideas, handling communication and organizing supplies in order to make their project successful. LYNX USE WINTER BREAK TO HELP OTHERS Over the final two weeks before Winter Break, Upper School advisories, faculty and staff collected holiday food boxes for families of students at Crump Elementary School. Lausanneâ&#x20AC;&#x2122;s partnership with Crump began at the start of this school year with the Class of 2022 tutoring Crump second-graders. Lausanne Upper School was challenged to create 50 food boxes for Crump families to enjoy over the winter break. Due to the overwhelming support of the Lausanne community and a $500 grant, over 80 boxes were collected. Each box consisted of canned vegetables, potatoes, stuffing, rolls, snack food, breakfast items, dessert, fruit, soup and a frozen turkey. On the morning of December 19, over 20 students and faculty members gathered to deliver the boxes. LAUSANNE STUDENTS RECOGNIZED FOR THEIR ARTISTIC TALENTS Out of thousands of entries and almost 800 awards given to approximately 50 tri-state (Tenn., Miss., Ark.) area schools participating in this year’s Mid-South Scholastic Art Awards, Lausanne students were recognized with 66 total awards, including 21 Gold Keys, 21 Silver Keys, 24 Honorable Mentions, and 3 Regional Sponsored Awards this year! STUDENTS HONORED BY FRIST MUSEUM AND MAGAZINE The current winter issue of the Frist Art Museum Magazine devoted a two-page spread to an interview featuring Marie-Pia Bonnot ‘19. In it, she talks about her art, her education in the States and France and her Lausanne experience. Marie-Pia, along with three other IB Visual Arts 2 seniors—Natalie Eslami ‘19, Jenny Rogers ‘19 and Solbok Yi ‘19, have artworks included in the current 2018 Young Tennessee Artists: Selections from Advanced Studio Art Programs exhibit now on display at the Frist Museum of Art in Nashville. Chosen from a statewide competitive pool of over 800 works from Advanced Placement Studio Art and International Baccalaureate Visual Arts classes in Tennessee, the 27 piece exhibit were on display at the Frist Museum until March 17, 2019. During winter break, the artists were honored at the Frist. ERIC GRAY WINS MR. FOOTBALL For the third time in a row, Eric Gray ‘19 has won the title of Mr. Football, making him the first player in the history of the award to gain the title three times. Eric and the rest of Lynx football had an impressive season, winning 38 straight games, the longest winning streak in the history of Shelby County. This season alone, Gray rushed for 2,510 yards and scored 40 touchdowns, all while keeping up a 3.4 GPA and scoring a 24 on the ACT. The all purpose running back was ranked No.1 at the position in the nation. NATIONAL HONORS SOCIETY INDUCTEES Forty Lausanne students were inducted into the National Honor Society in a ceremony in the Elder Performing Arts Center. The Class of 2019 added Jordan Brown, Dishan Desai, Nadia Elroz, Robyn Evans, Ziqi Guan, Alex Henry, Ethan Leggett, Jurique Maharaj, Naiya Nolan-Dillard, Kevin Ou, John Rack, Matthew Russell, Madeline Smith, Maggie Spence and Eliott Wright. Students inducted from the Class of 2020 included Dylan Andrews, Lindsey Baker, Marc Bonnot, Kelvin Borges, Jeff Chai, Drew Culbreath, Sophie Faughnan, Zoe Hamblen, Orli Katz, Kimberly Kerr, Saad Khan, Agnes Kovesdy, Jacqueline Lee, William Lenz, Lawrence Magdovitz, Damla Onder, Yagmur Onder, Freddie Rhodes, Anwesha Satapathy, Sultan Shah, Anaum Showkat, Christina Sigler, Andrew Sklar, Vilanna Wang and Ambria Williams. FIFTH-GRADERS COLLECT MARKERS TO BENEFIT THE PLANET After learning that 30 million tons of trash end up in landfills each year, Lausanne fifth-graders decided to take action by finding an item used in class on a daily basis and thinking of ways to reuse it. Students found a program developed by Crayola which allows the shipping of used markers to JBII, a plant in Niagara Falls. This program allows markers to be turned into clean energy and fuel. Over the course of the school year, the fifth-graders, who are responsible for the entire process, have been promoting the project and collecting markers to send to the plant. JUSTINE OKERSON ’01, CHAIR OF IDEAS Dr. Justine Okerson ‘01 was this year’s Chair of Ideas. She attended Lausanne from kindergarten through twelfth grade and currently works as the Associate Director for Merit Scholarship Programs in the Office of Undergraduate Scholars and Fellows at Duke University in Durham, NC. MIDDLE SCHOOL GOES UNDER THE SEA FOR BROADWAY PRODUCTION This year, the Lausanne Middle School presented The Little Mermaid, Jr. The show featured over 30 Middle School students involved and another 15 who worked on set design. The Little Mermaid Jr. is adapted from Disney’s Broadway production as well as the movie. Based on one of Hans Christian Andersen’s most beloved stories, Disney’s The Little Mermaid Jr. showcases the sacrifices we all make for love and acceptance. One of her most passionate pursuits has been changing the way people view the juvenile justice system. She co-founded and facilitates a group of teens who were tried as adults and incarcerated. Incarcerated Youth Speaking Out for Change (IYSOC) has been using its experiences as motivation and working to dismantle the schoolto-prison pipeline that plagues many groups of youth in the Memphis community. While the IYSOC program has been a huge undertaking towards helping youth in Memphis, this project only illustrates a small picture in the grand scheme of Mahal’s service work. If there is a local event or march related to activism happening, Mahal will more than likely be in attendance, and because of her work with the Memphis Activism Calendar coordinating committee, she likely helped plan it in some way. On any given day, Mahal can be found immersed in one of the many projects and organizations she helps lead. She is an ambassador for Facing History and Ourselves, a committee member for Project Mass Incarceration and also serves as the president for the Alternatives to Violence Project (AVP USA), a national program that aims at creating less violent communities. She cofounded the AVP Memphis chapter, which offers conflict resolution workshops in locked facilities through youth and adult facilitators. Mahal has gained national recognition and awards and has built an impressive resume thanks to her work, but it’s a quote by women’s and civil rights activist Fannie Lou Hamer drives her everyday. What started as an interest in a service project became the driving force in Mahal’s life as she continues to help shape the Memphis community through Mahal’s service to others. In October, Lynn Schiro Fitzwater ’63 and her husband, Jim, celebrated their 15th anniversary by taking the Queen Mary II from New York to Southampton, England. After a few days in London, they spent a month in Paris. They traveled back to San Francisco just in time for the holidays. Margaret Colbert Brown ‘64 lives in St. Augustine, Fla. with her husband of 49 years. The couple lives on a barrier island with three bridges which give them access to the mainland, where their daughter, Emily, resides. Margaret retired from Radford University, once the women’s college of Virginia Tech, where she taught two sections on the Vietnam War, a subject on which she was the first to teach a course. Upon retiring, Margaret began revisiting her own notes as well as her students’ journals and papers, resulting in That Time, That Place, That War, a dictionary of words and phrases spoken by the infantry during the Vietnam War. Her book was selected as the No. 1 History Book of 2012 by the Military Writers’ Society of America. In the photo, Margaret is wearing official British camouflage. Ana Alexandra Soler, daughter of Ana Picaza Soler ’65, married Tom Parker of London on November 17, 2018 at Islamorada in the Florida Keys. The bride’s 100-year old grandmother, pictured here with Esther Picaza on her mother’s side, were the bridesmaids. Carlin Agricola ’73 and former Lausanne student, Nancy Brown Dark, got together over the holidays and reminisced about their time together at Lausanne. They are hoping to reconnect with more of their former classmates soon. ALUMNI WEEKEND 2018 Over the weekend of September 28–29, 2018, more than 200 alumni returned to campus to celebrate Alumni Weekend. This was the event’s largest turnout in the school’s history. All alumni were invited to attend alongside graduates from classes ending in ‘4’ and ‘8’. The festivities began with the Homecoming reception and football game on Friday followed by the Lausanne 5K and Rise and Shine Alumni Brunch on Saturday morning. Alumni topped off the rest of their weekend at individual class reunion parties held at popular venues throughout the Memphis area. Eva Guggenheim ’74 says that although she is living in New York state, she is still a Southern girl at heart. She has been creating and illustrating “Scrumbles”—word jumbles with her own special twist—and sharing them with friends for years. Her Scrumbles were recently picked up as a regular feature in the Memphis periodical Storyboard. Eva was also the featured artist in the latest issue. In August, Robin Freeman Beaudoin ’95 was awarded the Allie Award by Ray Rico Freelance and Focus MidSouth for being of service and support to the LGBTQ community in Memphis. She was also awarded a Publisher’s Award for her journalism. For the second year in a row, Henry Rothenberg ’01 was invited to play as a celebrity guest member of the Harlem Globetrotters during their stop in Nashville. Henry also received a long term contract extension of five years to remain at the #1 CBS affiliate in the country, NewsChannel 5, WTVF-TV in Nashville, Tenn. and has been named to the Board of Directors for the National Weather Association Foundation. Congrats to Blythe Shaver ’02 and her husband on the birth of their daughter, Charlotte Anna Bezrukova, July, 2018. They are all still happily settled in Chicago, Ill., where Blythe is the Senior Sales Manager at the Waldorf Astoria. Jerald Trotter ’87, face and voice of the “Fed Up” gun violence ad, was recently featured in an article in the Memphis Daily News. The ad, which began airing on radio in June of 2018 and television in early August of 2018, is the latest in a series of anti-gun-violence commercials produced by Operation Safe Community, the local law enforcement criminal justice system coalition, and the Memphis-Shelby Crime Commission. Janelle Crandall Osowski ’05 and her husband, Eric, welcomed their son, Oliver Gray, on February 21, 2019. He was 8 lbs., 1 oz. and 20 inches long. Congratulations to the new mom and dad! Congrats to Josh Steiner ’10 and his restaurant, Strano by Chef Josh, for being named one of the top 10 best new restaurants for 2019 by Memphis Magazine. Josh, whose former restaurant was located in Cooper-Young, re-emerged this year in East Memphis utilizing his Sicilian-and-Moroccaninfluenced upbringing to inspire a comprehensive menu of Italian dishes based on the Sicilian practice of using the freshest possible ingredients. Lauren Avant Sumski ’08, head coach of the Rhodes womens Basketball Team, and Sharwil Bell ’08, volunteer assistant coach, lead the Lady Lynx to a win at the SAA Tournament in Jackson, Miss. in February. The Lynx defeated Oglethorpe 56-41 in the title game. Coach Sumski is the only one in league history to win a title as a player for Rhodes (2013 and 2014) and now as a coach. Rhodes women’s basketball concluded their 2018-19 season in the 2019 NCAA Division III Women’s Basketball Championship. The Lynx fell to the University of MaryHardin Baylor (UMHB) in the first round 70-56. In December, Ryan Thornton ’08 accepted an exciting new position in Media and Entertainment Partner Marketing for Facebook and Instagram. Olivia Lewis ’11 graduated in 2017 with a master’s degree from the University of Michigan in Urban Pedagogy. She recently moved back to Memphis where she is working for The Collective developing curriculum and teaching career readiness skills to adults aged 18 to 30. Ross Devlin ’13 graduated from the University of Edinburgh with an M.A. in Economics in 2017. As a student, he published his first book with two colleagues titled Morro Asfalto Mar, a socioeconomic study on the 2016 Olympics, which was funded by the university. Since the summer of 2017, Ross has worked as a credit analyst at International Paper in Memphis, where in 2019 he received the CEO’s Award. Deidre Staples ’13 made a stop at the Halloran Center in Memphis on February 16 while touring with The Crucible. Several of our production and theater students were excited to cheer on their fellow thespian. 2015 Christina Ridley Katzerman ’10 recently married Barney Katzerman on November 3, 2018 at the Memphis zoo, the same place where they had their first date and he proposed. For their honeymoon, they went to Italy and Switzerland. During their visit to Switzerland, they stayed in the city of Lausanne! Christina is currently a case manager at a local law firm here in Memphis, an events ambassador at the Memphis Zoo and also does freelance photography. Ridge Roberts ’15 is currently majoring in Marketing and Brand Management at the University of Memphis. He is working at Dixie Pickers, where he manages their social media pages and the graphic design for their advertisements. YOUNG ALUMNI DAY 2019 On Friday, January 4, 2019 the Lausanne Alumni Association kicked off the year with Young Alumni Day, beginning with the Young Alumni Panel which featured eight remarkable young alumni: Jarred Reed ’09, Will Murphy ’11, Sabaa Sharma ’13, Christine Odom ’15, Hannah Meskin ’17, Milanca Wang ’18, Lucas Davis ’18 and Jonathan Kagoo ’18. Young Alumni Day continued with a delicious networking lunch for our young alumni and the Class of 2019. Alumni were encouraged to visit the Alumni Office for a special young alumni t-shirt and swag bag. The panelists shared the experiences which led them to choose their respective colleges, universities, graduate programs, internships and careers. They answered questions about what to expect when entering college and whether or not they would make different choices if they were to maneuver the college process again. Let us know about new jobs, marriage, children, travel opportunities, gatherings with other Lausanne alumni, accolades and more! Email Charlotte Albertson, Director of Alumni of Affairs, at calbertson@lausanneschool.com. Aynsley Hartney ’16 and Carrie Robinson, past staff member and current parent, cheered on the Memphis Tigers in January. Aynsley also attended the College Football Playoff National Championship game Monday, January 7 as Clemson football faced off against Alabama. She is currently studying abroad in Denmark for her spring semester. Several members of the class of 2017 gathered at Nassem Yousef’s house over Thanksgiving break. Left to right, top row: Leah Blatteis ’17, Inaara Pirani ’17, Emma Whitehorn ’17 and Ethan Haworth ’17. Left to right, middle row: Andrew Gilreath ’17, Aaron Hunt ’17, Greg Bonnema ’17, and Cullen Burke. Bottom row: Nassem Yousef ’17. Members of our 2017 State Championship Football Team reunited over the Winter Break to catch up on life after Lausanne. From left to right: Anthony Elmore ’17, Cameron Kinley ’17, Jessie Neloms ’17, James Babb ’17, Camren Taylor ’17 and Mekhi Prince ’17. Peter Bahouth ’18 is enjoying his first year at Rhodes College. He is majoring in Biology and plans to work this summer. Ethan Ferguson ’18, a freshman at Rhodes College and founder of tech marketing and education startup, Augseption, was one of the speakers for the 2019 TEDxMemphis held February 2 at Crosstown Concourse. This year’s theme was “Ideas for the Next Century.” As a presenter, Ethan spoke about his work with schools in Shelby County to promote the adoption of virtual and augmented reality (VR/AR) in classroom curriculums. Ethan founded Augseption while still a student at Lausanne and has since been helping students at Crosstown High School with their project-based tech curriculum. Augseption also produces 360 videos and VR/AR for musicians, schools and charities. Ethan is a computer science major and Clarence Day Scholar at Rhodes and is dedicated to making a positive impact on Memphis through community service; consequently, he also participates in Facing History and Ourselves. Trey Herron ’18 is enjoying his first year at Furman University majoring in business and economics. Allison Kerr ’18 has received several acceptances from colleges and universities in the United Kingdom. She also recently auditioned with the University of Michigan Conservatory and is still practicing Arabic. SEPTEMBER 20–21 This is an annual event you don’t want to miss! More details will follow in the coming months. Update your information with the Alumni Office so you can stay in the loop by emailing calbertson@lausanneschool.com. Laura McKinnon ’18 is enjoying her first year at Purdue University majoring in mechanical engineering technologies. Ceylan Metin ’18 is a double major in biology of global health and Spanish/Portuguese studies and pre-med at Georgetown University. She is now EMT certified and will be working this semester at the student-run Georgetown EMS Group (GERMS). Tori Moore-McMiller ’18 is enjoying her first year at Cornell University majoring in hospitality management at the Hotel School. Mason Weiss ’18 has been very busy since graduating from Lausanne. During his gap year before attending UT Austin, Mason attended a wilderness program in Colorado and will soon be leaving for another program in Utah. Judith Wieland ’18 has had a great first semester at Florida State University. She added a second major in professional sales and is part of the professional fraternity, Gamma Iota Sigma. Noa Siskind ’18 went out to show support for our Lady Lynx Cheer team at Nationals in February, having been a former Lady Lynx cheerleader herself. We always love seeing our Lynx alumni athletes supporting our student athletes! To create a permanent remembrance for Bernard’s giving spirit and to continue his legacy of community service and care, an anonymous donor has established the Bernard Myers Memorial Financial Aid Endowment that yearly will provide support for a deserving Lausanne student. To be named the recipient of the Bernard Myers Memorial Award, the candidate must qualify for financial assistance and demonstrate: •A  sense of moral and ethical purpose as shown in his/her behavior toward his/her teachers, classmates and others • E mpathy for the emotional, intellectual, social and economic conditions of others •A  ssistance to others through community service • L eadership at Lausanne or in service to others outside of the Lausanne community The first recipient of the Bernard Myers Memorial Financial Aid Award will be named in the spring of 2019. Daniel Myers, Bernard’s brother, is honored that the endowment has been created in Bernard’s memory. Daniel, his wife Shari and their children Max ‘24, Vinny ‘30 and Zara ‘30, all students at Lausanne, know the fund will support and inspire generations of young people during their educational journey at the school they love. We are deeply grateful to have been chosen as the stewards of Bernard’s legacy and look forward to other opportunities to create permanent tributes on behalf of members of the Lausanne community. LAUSANNE TEACHERS GET INVOLVED IN THE COMMUNITY TOO! During Lausanneâ&#x20AC;&#x2122;s TeacherServe Day our faculty and staff volunteered at different non-profits across Shelby County to do their part in serving others. The group at Crump Elementary helped with book inventory and organizing spaces, while volunteers at the Down Syndrome Association of Memphis assisted with office work. A group of teachers helped with cleaning duties at the Humane Society of Memphis, and others delivered meals for MIFA’s Meals on Wheels initiative. At the Catholic Charities of West Tennessee, staff helped build care packages for the homeless and another group helped decorate Inspire Café with Black History month decorations. Several teachers contributed by tending to the gardens at Constance Abbey, while volunteers at Girls Inc. painted classrooms. Some stepped in as teaching assistants at Promise Academy, and others worked as docents at the Pink Palace. It’s always a good day when members of Lausanne have the opportunity to serve others in the community, and we are thankful for the organizations that allowed us help! Upper School World Languages teacher Erik Becker, Coach Chris Jordan, Upper School History teacher Lisa Bailey, Upper School World Languages teacher Rana Accawi and Upper School Math teacher Aubrey Zimmerling discuss how they plan to decorate at Inspire Cafe. By building character through service to others, students learn to be empathetic and resourceful while making a positive impact on the community. These experiences during their time at Lausanne allow them to develop confidence in their ability to make a difference now and in the future as they continue to work toward creating a better world. At Lausanne, we’re gearing up for our best summer ever! Party with a princess, shine as a superhero or build your backswing: there’s something for everyone. Explore all our options, and see how you can make a summer to remember at Lausanne! Register today at lausanneschool.com/summer.